This third-generation Chromebook has a design that is 30 percent thinner than its predecessor. It's also lighter and for the first time, it features an anti-glare display, making it ideal for families and students who want a Chromebook that can be enjoyed in a range of settings, even outdoors in sunlight. "The Acer C720 is a significant step forward for our highly-acclaimed Acer Chromebook line, as it delivers speedy performance, quick boot times, a matte anti-glare display and a slimmer design that is portable enough for anywhere use," said Arif Maskatia, chief technology officer, Acer America. "These key advances allow families and students to continue collaborating, learning and playing in exciting ways, all while staying secure since Chrome OS includes multiple layers of protection from online threats." The new Acer C720 Chromebook builds on the popular Acer C710 Chromebook, which was lauded for its performance and integration of Google's Chrome operating system at a ground-breaking affordable price. It meets the needs of students, families, anyone on a budget, and the growing number of customers who enjoy the Google ecosystem for school, work and entertainment. Customers can begin their online fun, research and social networking quickly with the Acer C720. It boots up in less than 7 seconds and resumes nearly instantly from sleep mode thanks to the fast Solid State Drive. (2) The new Chromebook is powered by an Intel Celeron 2955U processor based on the Intel Haswell micro-architecture, so it delivers a noticeable boost in both performance and battery life. The battery keeps customers going for up to 8.5 hours, ideal for all day productivity and fun. (1) Customers can power through web pages and docs, and will also enjoy fluid HD video and apps with the support of up to 4GB of DDR3L memory. (2) Plus, the Acer C720 quickly connects to hotspots and wireless networks via 802.11a/b/g/n WiFi. Customers will appreciate that the Chrome OS is updated automatically, so it always has the latest features. Multiple layers of security features including data encryption and verified boot defend the Acer C720 Chromebook against online threats, malware and viruses. This is especially useful for parents and school administrators who are responsible for protecting students. IT administrators can also manage the Chromebooks remotely for speedier app roll-outs and increased efficiency. 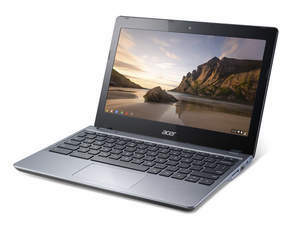 The Acer C720 Chromebook also keeps data safe when the device is used by multiple users, such as for collaboration in the classroom and for projects for home, school or work. Users can have separate accounts to ensure their project, Gmail and other information is kept safe if the Chromebook is lost, stolen, or lent to a friend. Also, Acer Chromebook customers are offered up to 100GB of free Google Drive storage for the first two years after purchase, so files, documents, photos and more are stored safely in the cloud. (3) Customers can also access files offline, and even open and edit MS Office documents as well as Google Documents. Schools will appreciate that the Acer C720 Chromebooks have a Kensington lock to secure them to a classroom or mobile cart. The new Acer C720 has a design that is more than 30 percent thinner than its predecessor, measuring only 0.75-inches thick. It still includes a full-sized keyboard, so customers can comfortably create and edit documents and spreadsheets. The device weighs only 2.76 pounds, so it's easy to carry in a backpack or bag. The slim and sleek size of the Acer C720 still provides room for a vibrant 11.6-inch ComfyView™ HD display with a 1366x768 resolution that keeps websites, images and video crisp and clear. Plus, the display has a matte, anti-glare property, enabling students and families to enjoy the Chromebook outside in sunlight for classwork, reading, playing games and more. The first model in the Acer C720 Series, the C720-2800, is available for pre-order now at Amazon.com and BestBuy.com with 4GB of memory and a 16GB SSD at a manufacturer's suggested retail price of only $249.99 in the United States. It will also be available this month at the Acer Store. Additional configurations will be available in the coming weeks. Established in 1976, Acer is an information and communication technology company dedicated to the research, design, marketing, sale and support of innovative products that enhance people's lives. Acer's green supply chain delivers environmentally friendly PCs, displays, projectors, servers, tablets and smartphones -- tools our customers need to explore beyond limits and experience more. Ranked No. 3 for notebooks globally (IDC 2012)(5), Acer employs 8,000 people, and 2012 revenues reached US$14.7 billion. Please visit www.acer.com for more information. © 2012 Acer America Corp. All rights reserved. Acer and the Acer logo are registered trademarks of Acer Inc. Other trademarks, registered trademarks, and/or service marks, indicated or otherwise, are the property of their respective owners. All offers subject to change without notice or obligation and may not be available through all sales channels. Prices listed are manufacturer suggested retail prices and may vary by location. Applicable sales tax extra. 4. Limited warranty agreement applies. For a copy, write to Acer Customer Service, P.O. Box 6137, Temple, TX 76503.